For horse-mad youngsters, being part of The Pony Club is one of the best ways to make friends and try new things. Going to camps, entering your first show and maybe even trying mounted games together, you and your pony improve your bond, hone your skills and make lifelong friendships, all in the safety of a supportive equine community. Hankering after your pony club days, or think riding clubs are just for kids? Adults like you are getting in on the fun, too, thanks to British Riding Clubs, with clinics, mentors and camps to enjoy. There are hundreds of clubs up and down the country, but it’s important to find one that not only attracts fellow grown-ups, but fits in with your lifestyle. “I live on theDorset/Hampshire/Wiltshire borders, so there’s a huge selection of clubs,” says Your Horse reader, Amy Walden. “But I wanted something that was predominantly adult that I could also fit in around my job. Another consideration is the events that the riding club has. Before you sign up, write a list of your goals and what you want to do with your horse. It’s no good choosing a club that caters mainly for happy hackers if you want to progress your dressage career. “We have a mentoring system at Wittering,” says Tracey Matthews, chairman of Wittering Academy Riding Club in Cambridgeshire. “Members are allocated a mentor who’s a trainer that they might not otherwise get the opportunity to ride with. They can then contact them for advice and receive subsidised lessons with them. It’s a great way to progress in your chosen field with your horse. In fact, joining a riding club can be your first port of call if you want to progress in your competitive career. Clubs are a hotbed for holding weekly events, including area and national qualifiers, as well as team competitions in various disciplines. Riding clubs are a great way to help you relax and enjoy your horse. 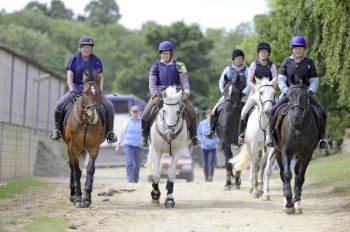 One riding club in London, Trent Park Equestrian Centre, not only offers a riding club solely for those aged over 18, it also has a monthly jaunt to the local pub on horseback. Along with fun rides and group hacks, you might also find a club that gives you and your horse the opportunity to get away for the weekend. Whatever your goals are for you and your horse, the right riding club will be able to help you achieve them. With exclusive clinics and lessons for members, you can do as much or as little as you want. Whether it’s ridden confidence you lack, or you want help to improve your partnership with your horse, a riding club will have the advice and expertise to help. With the variety of activities that clubs offer, your horse will be challenged like never before, and you’ll be on-hand to help him through it. You’ll soon notice those little things that bothered him while out hacking become nothing but a distant memory. Join a riding club and you’ll be surprised how many people out there are just like you — keen equestrians who want to enjoy their horses and make new friends. Experience your first clear round, have a training session with a pro or turn your hand to Le Trec. Many riding clubs offer you the chance to try just that, and if you decide something isn’t for you then there’s always something else. Riding clubs are excellent places to get your first foot on the competitive ladder and the excellent news is they’re always looking for representatives. Attempt your first clear round, join a team or aim for a national title — riding clubs offer events to suit whatever level you’re at. One top tip is to check out the events pages on their website to see what they’ve got going on.